The Old Foodie: Dangerous in Translation. The Renaissance Mannerist painter Jacopo Carrucci da Pontormo (1494-1557) kept a diary – we dont know for how long – and a portion of it survives to record his day to day activities, including his meals. His frequent asides about health and diet have been interpreted as indicating he was neurotic and hypochondriacal, but his references were perfectly in keeping with the times, when food and medicine were the same thing, and any minor symptom might have sinister implications. Friday evening salad, green pea soup and a pancake and bread for 5 cents. There is a Renaissance salad recipe in Platina’s “On right Pleasure and Good Health” (1475), which sounds delicious – apart from one possibly poisonous ingredient! This is from the Milham translation (1998). There may be likewise a seasoned salad from lettuce, borage, mint, calamint, fennel, parsley, wild thyme, marjoram, chervil, sow-thistle, which doctors call taraxicon, lancet , which they call lamb’s tongue, night-shade, flower of fennel, and several other aromatic herbs, well-washed and with the water pressed out. They need a large dish. They ought to be sprinkled with a lot of salt and moistened with oil, then after vinegar has been poured over and when they have sat for a little, their wild toughness demands eating and chewing well with the teeth. This dish requires more oil and less vinegar. It is more suitable in winter than in summer because it requires more digestion, which is strong in winter. Here we have an immediate conflict with our idea of a salad being healthy. 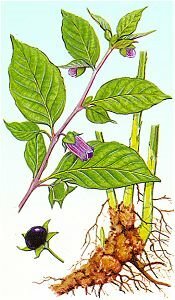 “Nightshade”, especially of the Deadly kind, is, well, – quite deadly. For Latin scholars, the original text is:“lactuca buglosso menta nepeta feniculo petroselino sisimbrio origano caerefolio cicerbita, quam taraxicon, lanceola, quam arnaglossam, medici vocant, morella, feniculi flore, ad plerisque aliis odorifiris herbis … ”. We cannot be certain exactly which herbs Platina intended: the translator here has used ‘borage’ for ‘buglosso’, but it could mean ox-tongue (Picris echioides) for example. However, it is ‘morella’ which is the real problem. The word comes from the Latin morus, meaning black, and variations of morel/morella refer to dark berries (as in the nightshades), a variety of cherry, a mushroom, and even a black horse. It seems fairly certain that nightshade berries were not intended in this salad, but an aromatic, leafy herb was. Perhaps one with dark leaves? Any ideas anyone? Tomorrow: Gin, brandy, beer and treacle.